Softball is a popular variant of baseball that originated in Chicago over a century ago. The sport travelled to Asia and got a foothold in Hong Kong. Although limited by space constraints and a shortage of softball diamonds across Hong Kong, a relatively small but dedicated group of people play softball with determination. Among them is Alvin Yeung, a partner in the Real Estate Development Team in Mayer Brown. Yeung started playing baseball while spending one of his early summers the U.S. but picked up softball by chance while studying in The University of Hong Kong (HKU). (He completed his first degree there and subsequently studied law at City University of Hong Kong (CityU).) The sport grew on him. He then became a founding member of the “93ers”, a team named after the address of the residency where he and his teammates lived – 93 Pokfulam Road. Two decades of commitment to the sport have turned Yeung into one of the most dedicated players in the city. He has been nominated for an award for most valuable player among other veterans in the Hong Kong Softball Association. Once or twice every week, Yeung can be found on the softball pitch, working to pitch hard, fast and accurately. Yeung says the pitcher is an important position, one that requires a high level of concentration and stress tolerance – two aspects of the game that he enjoys. “Playing this position in the team has helped me develop my ability to cope with stress,” he adds. A founding member of 93ers, Yeung has remained loyal to his team along with a few others, but many players have come and gone. The one thing they all have in common is that all the members were former residents of the same residence hall. Softball continued to take up an important place in Yeung’s life even after he graduated and started practicing law. “I’m still actively playing softball. 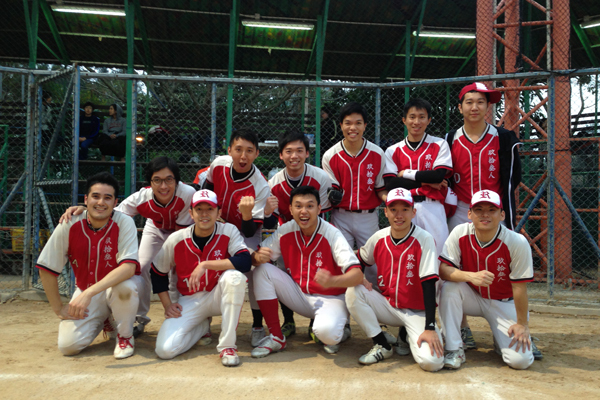 I take part in the open leagues held by the Hong Kong Softball Association,” Yeung says. He has had some success, as a pitcher and member of the 93ers. Last year, the team came out at the top of the Men’s Grade A Division. Softball teams are categorised in different grades within the league depending on their skill level. Grade C is for beginners whereas Grade A is for better players which is the level right under the Premier League. The 93ers have been playing in the league for almost two decades, mostly in Grade A. “Two years ago we dropped to Grade B as we did not play so well. But this hasn’t set us back. We played hard to get back into Grade A and even took home the championship last year,” Yeung says. Still, Yeung says he is mostly indifferent to the rankings, even as his team relegated from Grade A to Grade B and bounced back. He wasn’t always so indifferent. The first time the team made it into Grade A in 2009 will always remain a special moment for him. This year, the 93ers are preparing to make it up to the Premier League in the hopes of playing against other top players in Hong Kong. The team will hit the pitch later this month. Yeung has remained serious about softball throughout the years. The more he played, the more active he became. One year he was even the captain, a position in which he says he learned much. “When I was leading the team, I had to set up the time for training, accommodate the schedules of my teammates, motivate the team to play better and come up with strategies for the games, such as deciding who to play in certain positions and observing how the competitors play,” Yeung says. He found all these activities strikingly similar to his role in professional life. To successfully lead others, whether as team captain or law firm partner requires effective communication skills, says Yeung. Only through team effort can games be won. “You need to think about how you can motivate the whole team to get everyone on the same boat. This has to be done through lots of communications so you can better understand each other and be more considerate,” he explains. “Before the game, you have to come up with a time for practicing that everyone agrees on. On the field, you have to watch out for each other,” he says. Yeung was only captain for a year before his work started to get too busy. “Now I just enjoy being a player in the team. From time to time, I also give advice and guidance to the younger members as I have years of experience playing softball,” he says. His experience not only helps younger players but also the Hong Kong Softball Association. “I’m an advisor for the association and I was a council member there for a year. I try to offer help as much as I can when needed,” Yeung says. A veteran softball player, he has seen first-hand how limited land resources in the city can strangle the development of the sport. “There are only two fields for softball games throughout Hong Kong. When all the games are packed into the weekends, you can imagine how many teams can play,” Yeung says. Yeung also participated in efforts to build a better softball field at HKU, where he picked up the sport twenty years ago. “There’s a softball field at HKU and it went under renovation when I was a council member of the Hong Kong Softball Association. We gave advice to HKU on how to build a better field,” he says. Today, Yeung still insists to take time off from his busy work schedule to practice softball. “You just have to squeeze time out of your work. If you have set a date to practice softball, then stick with it. You can just go back to the office to finish your day later after practicing,” he says. Yeung practices once or twice every week, sometimes on his own and sometimes with his teammates at HKU. “There’s also a need for regular physical training to boost your fitness level,” he says. Besides softball, Yeung is also interested in basketball. He is a member of the basketball team of the Law Society and plays with the team whenever he has the time. Unfortunately, a lawyer-only softball team is not likely to happen any time soon. A big hurdle is that there are only a few softball players who are also lawyers. “I do know other lawyers who play softball as well. There’s already one in my team. But other lawyers are already in their teams, so it would be difficult to form another one just for lawyers,” Yeung says. Still, as a people person, Yeung enjoys playing team sports no matter whom he plays with. And being in a team – regardless of whether it is a sports team or a legal team – always makes him realise the importance of effective communication skills.